Molly the lamb has run away! Can you help shepherd Angus find her? Meet quirky villagers, collect items kleptomanically and enjoy colorful graphics during your quest. 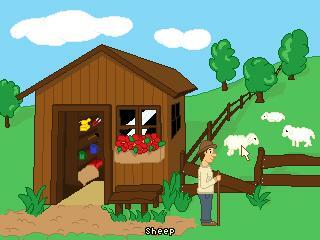 This game can be completed in under an hour and is suitable for children. German translation available - deutsche Ãœbersetzung vorhanden! MOLLY!!! Where oh where have you gone??? Seriously...who cannot get emotionally invested in a game about a poor lost sheep? So even if just for that: PLAY THIS CHARMING GAME!!! - and a motivational goal - Molly the Sheep! Very nice and light hearted. Great music, clear crisp visuals and good animation. It's not a hard game, and quite short but it does feel complete with a proper start and ending. The final sequence is cleverly done. Really fun adventure game, with some very nice touches and clever use of AGS. Excellent short game! Nice, low-key humor and a very relaxing atmosphere as mentioned. Solid, classic-style puzzles. The graphics are simple but well done, and there are lots of nice little visual flourishes throughout the game. I thought this was a good game and the bonus features at the end are nice too. A wonderful little game with clean visuals and creative puzzles. A cute and relaxing game, wonderfully suited for children or players who are not accustomed to the genre. Short and sweet. An adorable and fun little game. Well worth the forty or so minutes it will take to play. Lovely drawn characters with intividual personality, humor and really wonderful music. A little game to enjoy and one of the rare adventures that you also can play with a younger child to have fun together.